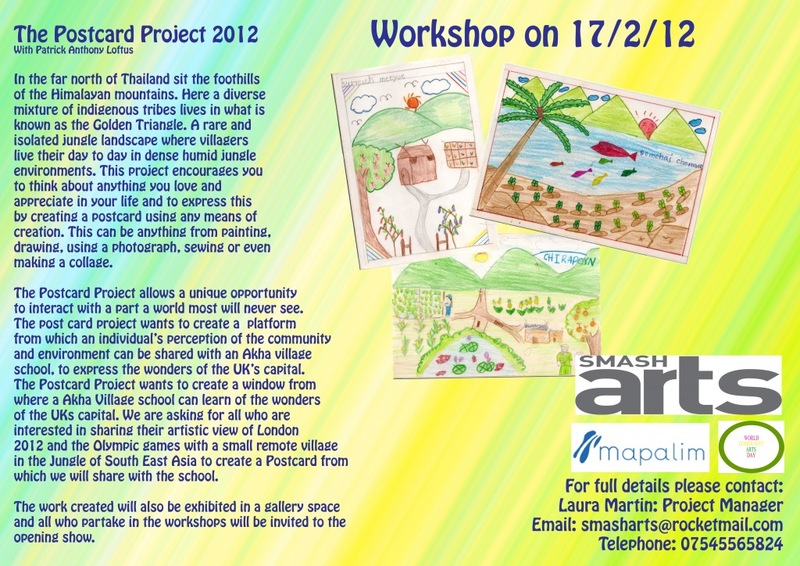 FREE Children’s Postcard Workshop…Roll up Roll up! World Community Arts Day is approaching fast, plus it’s HALF TERM! So why not join us this Friday 17th at our FREE postcard workshop? As part of our on-going project, The Organic Self: The Power of Value we are working with artist and photographer Patrick Anthony Loftus to deliver a FREE postcard making workshop for children. In keeping with our theme of exploring our personal values and how we are shaped by them, children will be asked to create a postcard depicting what they love and appreciate in life, with specific attention being paid to London and their view of the 2012 Olympic Games. Postcards can be created using any means of creation, from drawing, painting, collage or photography. The finished postcards will be displayed in our up-coming exhibition at the Parlour Gallery, Queen’s Crescent, Kentish Town and all workshop participants will be invited to come along and see their work on display. The postcards will also be sent to an Akha village school in South East Asia with whom our workshop leader Patrick has been working on this postcard project on a wider scale. The aim of the project is to create a window from which the Akha school can learn about the Uk’s capital from the personal point of view of the people who live there. Also creating a unique opportunity to interact with a part of the world most will never see. So for a creative half-term activity, and in the spirit of global community and value, why not bring your children along to our FREE workshop? You’ll find us at the Camden Community Law Centre, 2 Prince of Wales Road, NW5 3LQ. The workshop is FREE and starts at 10:30am on Friday 17th March. The email bounces, does anyone have another way of contacting?